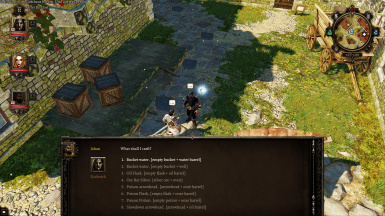 This mod introduces dialog based crafting and different options to transfer items to backpacks, specific containers or between player characters. Thanks to SniperHF and FrauBlake on the Larian Forum for information about and discussion of engine and editor related issues. Credits to Norbyte for his file extraction and converter tool. Thanks to Larian Studios for the game and the Divinity Editor. 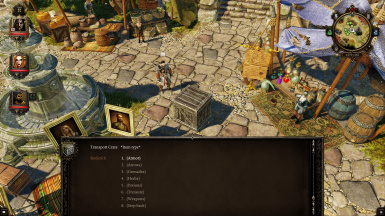 The more time one spends in Divinity Original Sin the bigger becomes the chaos of items filling character inventories to capacity. Despite a few options to automatically sort items and containers that can be used to manually store and organize items there is still some need regarding inventory management, especially when it comes to crafting and trading which usually requires item transfers between several characters several times. This mod tries to facilitate some processes by introducing dialog based crafting and different options for item transfer. After a testing phase with improvements and a few additions BetterLogistics is finished now. Nevertheless, feel free to make suggestions for future additions in the comment section! - ca. 200 recipes of D:OS EE supported for crafting in dialog: potions, grenades, arrows, arrow ingredients, dust, lockpicks, backpacks etc. 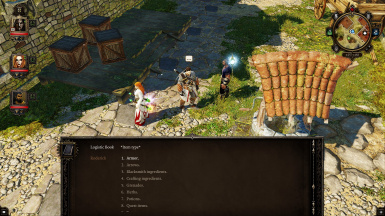 All required crafting and blacksmith ingredients for not supported recipes can be transferred to the crafting character though (s. below). This mod requires starting a new game! Follow the instructions in the README section. Easy to install! This mod is made for D:OS Enhanced Edition. It's not compatible with D:OS Classic Version. The Mod requires a new game, I would not recommend to use it with existing games. Mod save games aren't playable without activated mod. So compatible with my mods: GetRidOfQuestmarkers and StandStillWhenIAttack. SamaritanMod is included in BetterLogistics (Standard and Scales Version). Its features can be activated by a book you find in one of your main players' inventory. There are new AI-functions added: clearing fire surfaces, removing burning, casting haste on the leading character (Pyro), casting Perception boost on the character with the highest perception and protecting characters near lava surfaces with the most effective spells (if available). A version for use with Scales is available under main files. I haven't tested if all files of Scales will be read from Main and Shared when a mod is activated, so I can't guaranty that all features of Scales will work - though they should. If you use both mods I'd be glad about feedback! It can be used with BetterLogistics. Jahan (library) and Madora (tavern) are the only characters excluded from the changes of QuietDayOnTheMarket. If you are unsure about compatibilities with mods you (would like to) use contact me in the POSTS section. For modders: The only used Story File from Main Campaign is CYS_General to add some items to main player characters.